Bath Body Lotion and Soap: Need a new body scrub? My skin has been pretty happy. This body scrub is primarily geared for those with normal to dry skin. Sea salt, almond granules, and organic sugar do all the hard work of removing the dead skin cells. Then, almond oil finishes off the process to make your skin feel silky smooth. 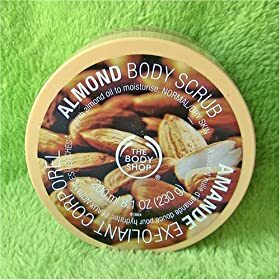 This is probably my favorite out of the The Body Shop's line, but I'm also a fan of the mango butter.